PRODUCT: EasyGate BV – Stainless Steel with GetaCore Cabinet Cladding SECTOR: Grade A Office CLIENT: 55 Colmore Row LOCATION: Birmingham 55 Colmore Row is a recently completed mixed use development in the heart of Birmingham’s Central Business District. Offering 160,000 sq ft of prime Grade A office space, and is a perfect combination of historical architecture and contemporary office space. Since being acquired by IM Properties in 2014, 55 Colmore Row has undergone a dramatic transformation resulting in a truly unique and upmarket office space. Much of the building’s Victorian façade is Grade II listed and acts as an integral part of the historic streetscape, but behind the façade a dramatic redevelopment has taken place to offer an exceptional range of flexible and high quality office space. 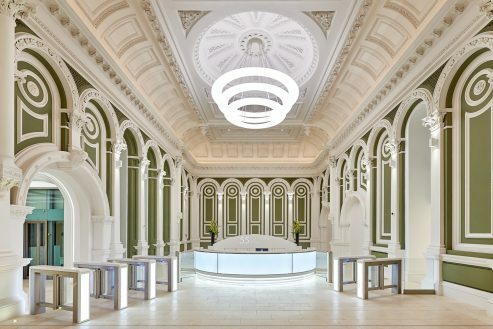 The historic 19th Century banking hall, has been restored and reconfigured and takes pride of place as the building’s reception area. 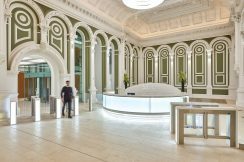 The bespoke illuminated reception desk provides a dramatic counterpoint to the traditional features of the banking hall. 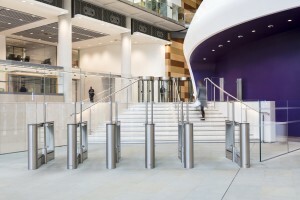 For such a unique reception, a bespoke entrance security solution was required. 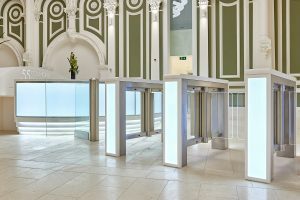 With a strong track record of delivering highly bespoke solutions, whilst maintaining a competitive price, Meesons were selected to deliver a unique entrance control solution. The client requested bespoke illuminated speed gate cabinets and glass wings that would match the illuminated reception desk, and a white GetaCore solid surface cladding to complement the architecture of the room. Meesons were able to integrate the clients LED light panels into the cabinet legs to match the design of the reception desk. The speed gate software was also configured with the reception desk to enable the level of light to be dimmable. Maximising the space available in the reception area, Meesons delivered four lanes of EasyGate BV speed gates and two wide access Pegas gates. 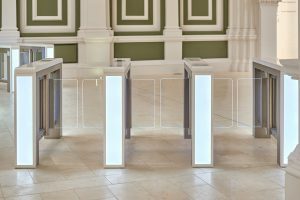 To make the best use of the space available and prevent compromising on the aesthetics, the access control for the Pegas gates was integrated into the speed gate side cabinet. 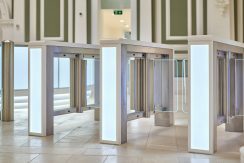 To help manage the flow of users in the lift lobby the lift call display was integrated into the speed gate cabinets to allow for quick and efficient throughput.